You’ll hopefully forgive 2strokebuzz if coverage of the 2007 Cycle World International Motorcycle show is a little scaled back this year. The truth is, very little has changed from year to year. Each year there are fewer surprises, less swag, and fewer perks (the bus service to the CTA parking lot was cancelled this year, brrr. ), while parking, concessions, and admission (at least seem to) get more expensive. Probably that’s why Triumph didn’t appear for the second year in a row, and why Kymco, CMSI, and Genuine rarely bother with these shows. On top of that, we had a head start on new 2007 models, thanks to the Milan EIMCA show, and next weekend I’m attending the Indianapolis Dealer Expo (my first trip), which promises to be a bit more exciting. But out of a sense of duty, and because Ryan was driving, I decided to once again trek through the Donald E. Stephens Convention Center in Rosemont, IL, to see what there was to see. Which wasn’t much, really. 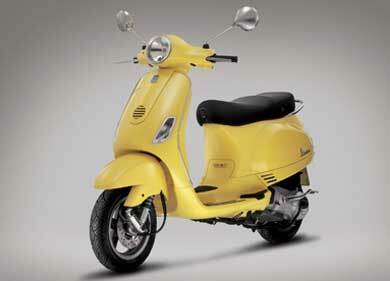 After presenting some one-off 60th-Anniversary retro concept Vespas at last year’s EICMA show, Vespa suprised the world this April, announcing that the three models would actually go into production. All three were basically retro-cosmetic upgrades of existing models. The first, the GTS-based GT60, is shipping now to dealers in a very limited edition that’s probably already sold out. The next two will see a wider release, and are apparently coming very soon. The first of these, the GTV, is a GTS remodeled to emulate Vespa’s exposed-handlebar fenderlight bikes of the early Fifties. It’s been talked-about for a year now, so the only surprise is that it will be available in both 125 and 250cc displacements, and in a traditional green color called “Portofino” in addition to the promised “Avio Grey.” Our prediction is that a 125 cc four-stroke engine in a GTS body will give the rider the true experience of a fifties Vespa — speedwise, anyway (see GTS 125, below). The other Anniversary model promised in April was the LXV, which brings the glamour of the Sixties Vespa to the LX range of modern Vespas. 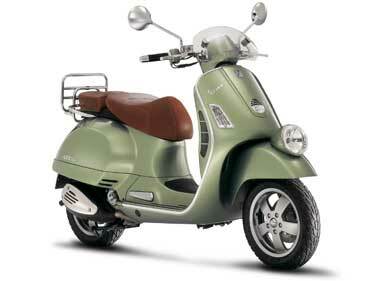 Again, the only fresh news to report is that it will be available in both LX displacements (the LX50 features the new 2-stroke Hi-Per2 motor), and like all early Vespas (and the new GTVs), it will be sold in your choice of leftover battleship grey, or leftover tank green. 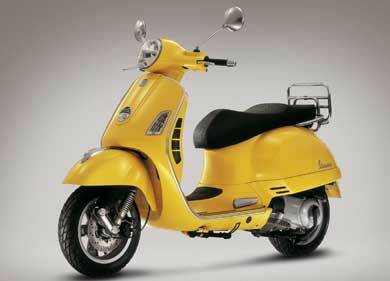 Luckily, Piaggio kept one Anniversary model a secret until last week. Seeing the first photos of the Vespa S, we accurately noted it’s stylistic nod to the Vespa 50 Special, but mistook it for a superficially retrofitted LX. On closer inspection, while the general dimensions and displacements (50 and 125) match the LX, there are some rather significant design differences. Most obvious is the legshield, which discards the plastic insert of the LX, returning to a more traditional shape and contour than any scooter since the PK series. The Corsa-style seat looks as magically uncomfortable as the original. Details like the fender and tailight add to the impression that the Vespa smallframe is back, although for some reason, of all the great smallframe models to choose from, they gave it the horncasting and square headlight of a Vespa 50 Special. (Apparently, every European teenager in the 1970s lost their virginity on the 50 Special, so we’ll let that decision slide) It’s impossible to look at this bike and not want to add a dummy tank and spare tire behind the legshield. It evokes the spirit of the original without being superficial or corny, and that’s more than can be said about the bigger and more expensive 60th Anniversary models. 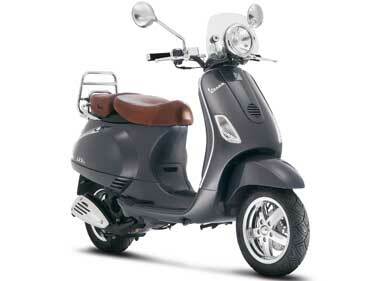 The 50 features the 2-stroke Hi-Per, the 125 has the 4-stroke LEADER. Hello, Neue Primavera. 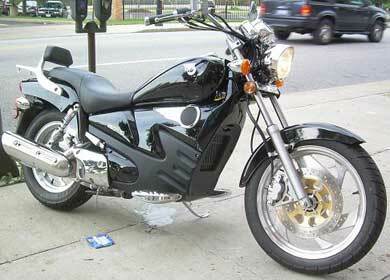 Differences may be eluding me, but I see nothing new about the GTS 250. It seems like every GTS I’ve ever seen was green, so perhaps “Midnight Blue, Lime Yellow, Excalibur Grey, Shiny Black and Dragon Red.” are new colors, but perhaps not. (Are the optional anti-lock brakes new? Does anyone actually want ABS on a motorcycle?) The new GTS 125 is targeted towards European teenagers with a A1 license or older riders who don’t want to go through motorcycle testing. It features the 125 LEADER engine, which as noted above, doesn’t seem like much displacement for a heavy GTS frame, though the same engine will power the even heavier US-market MP3 (or whatever they decide to call it here). As with the GTS, the only changes from 2006 in the LX range appear to be displacement and paint. 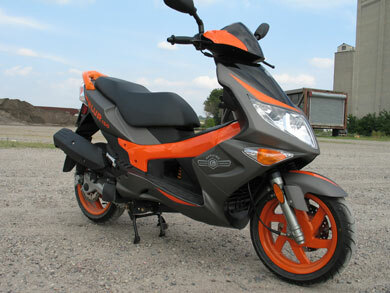 Four engine choices are available: a 50cc 2 stroke Hi-Per2, a 50cc 4-stroke Hi-Per4, and 125cc or 150cc 4-stroke LEADERs. Colors for 2007 are Tibet, Sky Blue, Lime Yellow, Excalibur Grey, Graphite Black and Dragon Red for the 50s, Portofino, Midnight Blue, Lime Yellow, Excalibur Grey, Graphite Black and Dragon Red for the 125 and 150. Check out our ever-expanding 2006 EICMA Gallery for more photos. Still to come: Derbi, Piaggio, and Aprilia’s EICMA offerings, plus anything else we can scrape up about the non-Piaggio-made scooters on display. One of the biggest stories at EICMA, scooters or otherwise, is Gilera’s new 75hp, 850cc GP 800 (Gilera might be the first manufacturer to ever round down cc’s for a model name). The GP features a V-twin 8-valve liquid-cooled engine in a Runner-like body (reports this summer predicted it’d be called a “Runner”) outfitted with a CVT automatic transmission, a horizontal single rear shock, and twin front discs. The only way to describe it is “Automatic Sportbike.” Whether the performance is comparable to an 800cc sportbike remains to be seen, but it’s going to outpace just about any other scooter. And the price will surely reflect the displacement. We’ve already talked about this a bit, but we now have some new photos in the gallery. 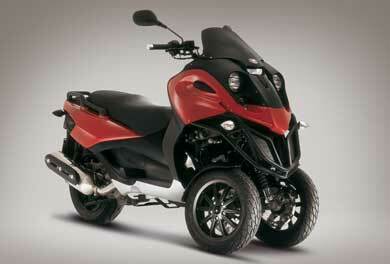 As reported, it’s a MASTER 492cc engine in a sporty frame with tilting dual front wheels borrowed from the Piaggio MP3. The rest of the lineup is a bit less exciting. 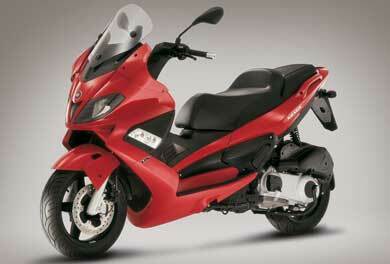 The Nexus 125 is Gilera’s sporty Nexus 250 scooter with a downsized engine for 16-year-olds with a Euro A1 license. It’s a fairly large bike, and presumably not as peppy with the smaller engine, but the high-end features are retained from the bigger models, so at least it’s still flashy and luxurious. Adorably, the underseat compartment has been redesigned to hold a fullface helmet AND a half-shell for unexpected guests. The Stalker 50, Gilera’s version of the Piaggio Typhoon, now comes with a 2-stroke Hi-PER2 PRO engine previously found in the Gilera DNA and Piaggio NRG. Dig those “Urban Graffiti” graphics. It’s Christmas morning in Bari, and little Gio has just turned 16. He’s been begging his parents for two months for the new Gilera Nexus 125, but the butcher shop hasn’t been doing so well, and when they lead them to the garage and uncover his eyes, he sees a blaring “Stalker” decal glaring back at him. He’s polite, and it’s still a brand-new scooter after all, a good brand, better than most of his friends’, and out of his parent’s budget. And thank God it’s not the white one. But it’s still not easy to hide his disappointment. By mid-January, all the kids at school are calling him “Il Stalker” and Annabella has dumped him for an 18-year-old with a ten-year-old Runner 180. Gio and his friend Mario save up enough money to buy a 133 kit and a sports exhaust from a kid that crashed his Typhoon. They peel off the “Stalker” decal and put a big Inter Milan sticker on it, and decide it’s not such a bad bike after all. See more photos in our EICMA 2006 gallery. This my first review of a scooter in more than ten years of writing 2strokebuzz. My first scooter was a vintage Vespa and have pretty much stuck to what I know. I’ve taken a few spins on various modern scooters, and have been impressed by some, and not by others. The Blur impressed me. This doesn’t seem to work as well with automatic motorcycles. What Honda did so well with the Hondamatic 30 years ago is being re-introduced by the Chinese, in a typically Chinese fashion. The CF Moto V5 is currently being distributed by Big Jim’s Wholesale, who has recently taken on the more scooter-friendly name of TwinCityScooters.com. We’ve been considering bringing them in as a line here at POC and talked to their reps at Indy. Their bikes had intrigued me, but I was skeptical about the quality. Three weeks or so ago I was killing layover time in the Duty Free shop of the Montreal-Dorval International Airport. While balancing two cartons of Export A’s and giant bars of Toblerone, I spotted a familiar face checking out the bottles of fine liquor. Sure enough, it was Scott Smallwood of Supersonic Scooters of Columbus, Ohio. He had some time to kill as well, so we made our way to an airport bar for some coffee. Within an hour the coffee turned into vodka tonics and our conversation turned into a question and answer session regarding Scott’s endeavors. Scooters and motorcycles are everywhere, even as the temperature hovered around the freezing point. (Lap aprons are very common on motorcycles and scooters.) Basically, the whole town sounds like you’re at a scooter rally, all day and all night. Scooters easily outnumber motorcycles 3-1. 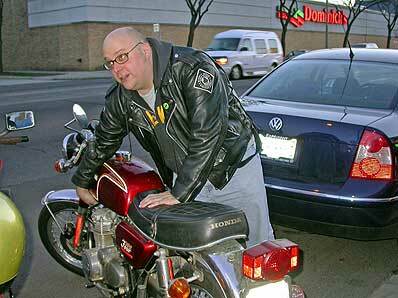 Most motorcycles we saw were small-displacement and Asian, the few bigger ones we saw were usually Ducatis or BMWs. It’s impossible to walk a block on any street in Paris without seeing several scooters parked on the sidewalk. Nirvana for American scooterists, but probably no fun for most pedestrians. 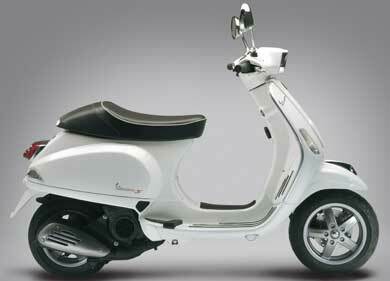 Piaggio definitely dominates the market, even over Peugeot. Modern Vespas (ETs and GTs) and Piaggios (X9s and Libertys) are everywhere, and P-series scooters were far more common than i expected, maybe 1 out of 20 scooters was a P or PK-series. There were a good number of Peugeots, but mostly older beaters, I saw only a couple Speedfights. 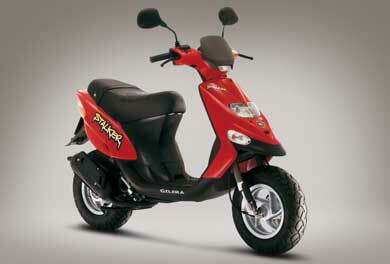 In Ireland a couple years ago, Gilera Runners dominated the market, but we only saw one in Paris. 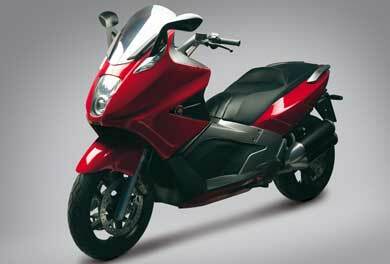 Kymco and Aprilia also had a decent share of the market. Chinese and Taiwanese scooters were common, but I saw few Hondas or Yamahas, and no “retro” Asian scooters other than one Honda Joker (called the “Shadow” there?). Most scooters, even the relatively expensive Vespas, were healthily thrashed, parked against walls and each other with stickers and dents galore. They’re transportation there, not fetish objects. We did see several nicely-maintained vintage Vespas that were clearly owned by lifestyle scooterists, mostly smallframes like the one above. As far as 4-wheeled vehicles, I couldn’t believe the number of Smart Cars, they’re cleaning up there. Minis (both old and new) were common, and all manner of tiny CitrÃ¶ens, Peugeots, and Renaults were everywhere. VW and Audi were probably the biggest importers. All the cars were tiny: the streets are narrow, traffic and parking is a nightmare, and gas is expensive. One of the biggest popular cars was a 2-door version of the Toyota Rav-4. Like the scooters, the cars mostly looked like they’d had a hard life. I’ll post more later about the two scooter shops we visited.